President Barack Obama declared climate change to be the defining threat of this century as he began a historic visit to the far northwestern state of Alaska. Speaking Monday at a State Department-sponsored summit on Arctic environmental issues, President Obama said the world is "not acting fast enough" to address climate change. "On this issue of all issues, there is such a thing as being too late,'' Obama said. "And that moment is almost upon us." "Human activity is disrupting the climate, in many ways, faster than we previously thought. The science is stark. It is sharpening. It proves that this once distance threat is now very much in the present," he said. Obama, the first sitting U.S. president to visit the Arctic Circle, highlighted what he said were the particularly devastating effects climate change is having on Alaska. "Over the past 60 years, Alaska has warmed about twice as fast as the rest of the United States," he said. "Last year was Alaska's warmest year on record - just as it was for the rest of the world." This is resulting in rapidly melting glaciers, warmer and more acidic oceans and rivers, reduced sea levels, and "some of the swiftest shoreline erosion rates in the world," Obama said. The president also hit out at his domestic critics, some of whom have accused him of exaggerating the threat of climate change or argued that his recent environmental policies are hurting the economy. "There doesn't have to be a conflict between a sound environment and strong economic growth," the president said, arguing the cost will be higher if nations do nothing to combat climate change. "The time to plead ignorance is surely past. Those who want to deny the science are on their own. They are on their own shrinking island," he said. 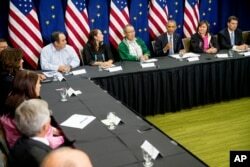 President Barack Obama, third from right, participates in a roundtable with Alaska natives at Dena’ina Civic and Convention Center, Aug. 31, 2015, in Anchorage, Alaska. Earlier, ministers from 11 countries and the European Union reaffirmed a commitment to take "urgent" action to slow the pace of of global warming in the sensitive Arctic region. The officials from countries including the U.S., France, South Korea and Singapore announced their pledge in a joint statement on Monday, at the so-called GLACIER Conference. Delegates at the U.S.-sponsored conference have focused on the global implications of climate change. “We take seriously warnings by scientists,” said the ministers in their joint statement. “Temperatures at the Arctic are increasing at more than twice the average global rate. Loss of Arctic snow and ice is accelerating the warming of the planet as a whole,” they said. Native Alaskans attending the conference expressed concern that they are on the front lines of climate change. “We are very, very concerned about our Mother Earth,” said Alaska Tribal Chief Lee Stephan. “Alaska is not causing global warming. However, the actions of the globe is affecting Alaska,” he said. The meeting in Alaska comes ahead of a U.N. conference on climate change later this year. President Obama's highly publicized, three-day tour of the region will include a hike to a glacier. He will also appear on a reality television show with adventurer Bear Grylls. People gather outside the Dena’ina Civic and Convention Center in Anchorage, Alaska, Aug. 31, 2015, before Obama is scheduled to speak at the Global Leadership in the Arctic: Cooperation, Innovation, Engagement and Resilience (GLACIER) Conference. Ahead of his trip, the president drew fire from some lawmakers for his decision to change the name of Alaska’s tallest mountain from Mt. McKinley to Denali. The peak was named Mount McKinley in the late 1800s in honor of William McKinley, an Ohio resident who became a U.S. president. House Speaker John Boehner said the name had served as a “testament” to McKinley’s “great legacy.” He said he was “deeply disappointed” with Obama’s decision to change the name. In a statement, Interior Secretary Sally Jewell said McKinley never visited the region and had no significant connection to the mountain, which native Alaskans called Denali. 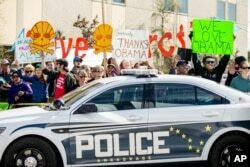 The Obama administration has also drawn fire over environmentalists for a decision to allow the Shell Oil company to expand drilling off the coast of Alaska. In his weekly address, Obama defended the decision, saying that safety in the environmentally sensitive region will be a priority. “We made it clear that Shell has to meet our high standards in how they conduct their operations,” said the president. The White House says the goal of the conference is to boost awareness of how the effects of higher temperatures in the Arctic are affecting the rest of the world and what people can do in response. Obama has announced plans to make U.S. power plants cut carbon dioxide emissions by 32 percent below 2005 levels, while also boosting the amount of power they generate using renewable resources. Scientists have warned that letting global temperatures rise more than 2 degrees Celsius above pre-industrial levels will bring extreme weather and rising seas that would affect populations all over the world. William Gallo contributed to this report from Washington.